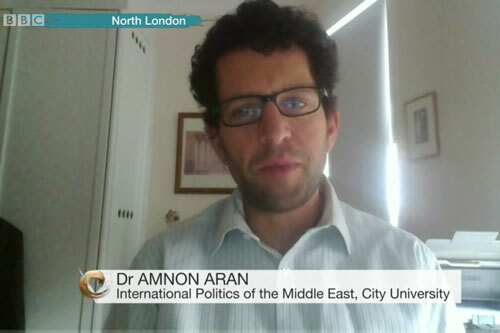 The arrangement of a ceasefire in Syria reflects the growing influence of Russia in the Middle East country’s civil war, according to City’s Dr Amnon Aran. The academic, a Senior Lecturer in the Department of International Politics, discussed the issue in a television interview with BBC News (1:00:10). Asked if he believed the ceasefire could make a difference, Dr Aran suggested the proposal benefitted Russian interests and the Syrian government led by Bashar al-Assad. “This ceasefire really reflects a deeper trend,” he said. “Up until now, the Syrian conflict was in a political stalemate, especially because of the military stalemate that underlined it. Dr Aran also discussed the question of whether it was possible for the ceasefire to be implemented successfully. He said: “I think that it very much depends on two things – [firstly], how weak militarily the opposition to the Assad regime has become. If they have become too weak to fight, then perhaps they will lay down their arms temporarily. “And secondly, [it depends on] the degree to which the Assad regime and the Russians will continue their offensive, especially in the area of Aleppo, because the wording [of the ceasefire document] – that attacks against so-called, or not so-called, terrorist groups can continue – really leaves a very wide remit for military attacks to continue. On the question of why Russia had supported the ceasefire, Dr Aran explained it represented the nation’s increasing efforts to influence diplomacy in the region, in addition to its military involvement. He said: “It seems to me that this is the continuation of a trend that has been going on for some time, whereby Russia has been asserting itself within the Syrian conflict as the main external player – together of course with the Assad regime and Iran and Hezbollah – and the west, especially of course the United States, keeping a distance, with the exception of the bombing of ISIS.